This entry was posted in Bipolar and tagged Bipolar, Depression, diagnosis, hypomania, Mania, mental health, mental illness, mixed state, mood chart, mood tracking. Bookmark the permalink. What a great idea! I haven’t done any mood charting, but I can definately see the benefit. I think I’m going to try this color block chart. Thanks for your post! Excellent! Thanks for stopping by! I am a spreadsheet junkie too, I hope you keep up with it, it really becomes extremely helpful over time! I love the idea. That is the one thing I dislike about the free beta version of Moodscope (no idea if the paid-for version is different) is that while I might score a, let’s say, 9% two days in a row, those 9%s could represent drastically different moods, especially in relation to the amounts of anxiety, paranoia, and psychosis I experience. But I think I would have a similar problem as despitemyself described–I’m much better at tracking during manic days than depressed days such as being better at blogging, journalling, etc. I even re-booted my blog during a manic cycle, posting every day, then BAM, no posts. But having anything objective on paper is a big help when dealing with doctors. My counselor is NOT a chart person, but my two psychiatrists (one for meds; one for clinical diagnosis) have such short attention spans that a graph or something is so much easier. Maybe once I get thought this initial crisis period with everything, I will be able to collect more data. I agree with you completely on the Moodscope thing. And that is my chief complaint with their process, the attributes they use to measure mood aren’t really ones that I would use to measure my own, and there is no distinguishing between what type of mood it is when you get the same score in several situations. It is “smart” but not “intelligent”. I agree, I don’t really identify with the attributes, but they’re a standard APA scale, so that means they’ve tested the heck out of them for validity. The premium service gives you access to Affectograms and Triggergrams, which I find useful for seeing trends. Recently my affectogram shows that I’ve been feeling guilty a lot and not particularly engaged, which is pretty accurate. Actually, using those items over a long period of time has made me think a bit differently about how I feel – if I’m frustrated, how does that translate? Angry, worried, irritable, or some combination thereof? I’ve since come to realize that a lot of what I call frustration is based in anger and irritability but I never recognized it as such. I’ve been continuing to use Moodscope as something of a “second set of eyes” to have another perspective on what my moods might be doing, independent of what I think they’re doing. In that respect, I have enjoyed it, and the sharing tool has been fun to play with in conjunction with some other bipolar folks I know. Unfortunately, a paid feature isn’t quite in my budget at the moment, but that might change. I am interested to at least try those features out, so I may subscribe -if just for a little while. Awesome! It is definitely odd to me any time I have one of those realizations that I am doing better/not as well than I had though, perspective is such an interesting thing to me -which is why I am obsessed with so many charting techniques I guess! I am glad you found something useful, thanks for stopping by! This is awesome! I’d make one myself but I have so much data that it would be a huge drag. Oh, right. Like intothesystem just said. Duh. My spreadsheet uses conditional formating to colour the blocks. I enter a score either -5 to -1 for depressed mood (shaded in blue – darker for more depressed), +1 – 5 for manic moods. (shaded in red – stronger for more manic) 0 for normal (in white). and then I also use *1 *2 or *3 for mixed moods – *3 causing the most distress and *1 the least. These are manually coloured in lilac through to purple. I printed it off for my GP recently and he seemed to like it, although he was concerned by the large amount of colour this year compared to the mainly white sections (normal mood) of last year. It makes things really easy to see. has made my manic episodes and anxiety-depression easier to track patterns. This is really helpful. A friend linked me to your “mood chart” tag because I was looking for a better way to show my psych APRN the mood cycle that I’ve been observing. I can see the depression and hypomania in a pattern, but when I tried to turn my other mood tracking methods into a line chart it became this nonsensical zigzag that didn’t show my overall mood during a time period. I’m going back through my journal now and coloring in a calendar with your method – about 2.5 weeks done so far, and I’m aiming to get at least the last 3 months finished before my appointment Thursday. That is exactly why I started using this technique, good luck on finishing before Thursday! 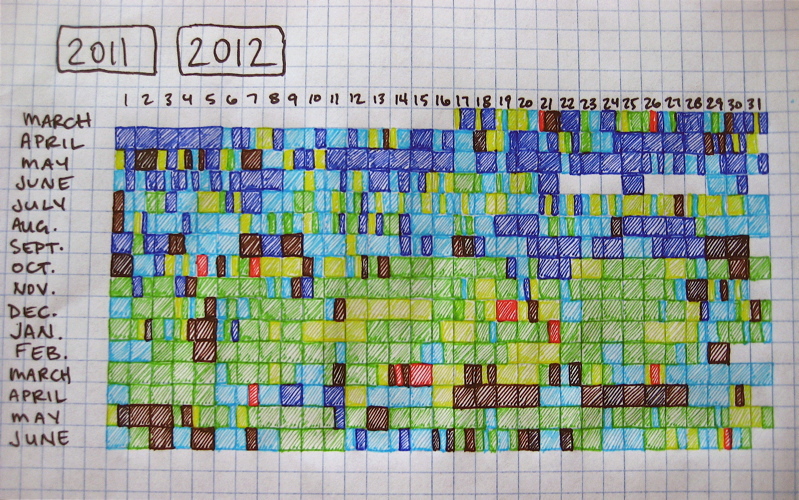 I know how time consuming turning data into little colored squares can be!